I have a love affair with this vegan pesto. Seriously, I have made this three times just this week alone! With only five ingredients plus salt and pepper, you can make this sauce easily in under five minutes, and have dinner ready to go in ten. I have really been enjoying making scrambled tofu with vegan pesto and cherry tomatoes. It makes a delicious savory vegan breakfast wrap, and it’s ready in a pinch if you have the pesto set to go in the fridge. The video for that meal is coming soon on our new Youtube Channel! For lunch or dinner, I will usually toss this sauce with whole wheat spaghetti and tofu, then stir in some baby kale while it’s still hot enough to wilt. 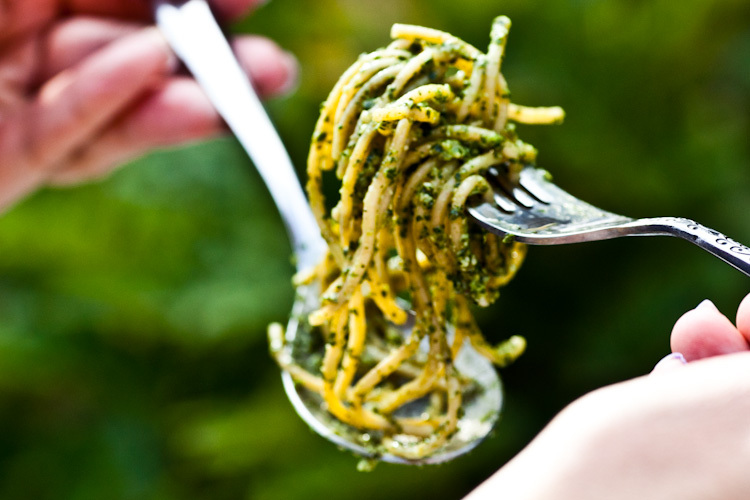 I just brought a huge bowl of this pesto pasta to an epic lakeside picnic brunch with friends. It was gobbled up and raved about all afternoon. In the spirit of fun and delicious food, we are making it a local LA Meetup called Disco Picnic, so be on the look out for that as well! We brought our bright green, tasty jar of fresh vegan pesto out to visit our newly replanted basil plant! Hopefully the plant will be inspired to grow into a giant bush and fulfill its delicious culinary destiny. The absolute BEST vegan pesto around! Cheezy, flavorful, and garlicky. Perfect for pasta, as a spread, or for making scrambled tofu. Rinse the basil, wringing out most of the water and toweling it off a bit. A small amount of water is ok. Combine all ingredients in a large food processor. Mix for 2 minutes. What did you think of this recipe? Tell us in the comments below! Tom uses pine nut for his pesto. Why do you use hemp seeds? What do they taste like? I’m sure I’d love your recipe to becuase I love the taste of fresh basil. Hemp seeds are really nutritious. They have more protein than pine nuts (a concern for some vegans) and are also about 1/3 of the price! I use them in so many dishes and smoothies. The flavor is mild and nutty. I think I will try pesto with hemp seeds. I do use walnuts and also add fresh mint to my pesto. We love this recipe, we use it for pasta and pizza! Mine turned out kinda gunky, like it was very difficult to mix, is there anything I can do to fix this? That’s a shame! We are sorry to hear that. Are you using a food processor or high powered blender? A regular blender would require much more blending time for the pesto. I would try blending again adding a tablespoon of olive oil or water at a time until you reach the desired consistency. Hope this helps! How long would it keep in the fridge? The pesto is good in the fridge for up to five days, although it usually disappears much faster than that! Do you think I could use unhulled hemp seeds?